Ethnic organized crime is a phenomenon that has been largely ignored by social scientists and historians, and dismissed as a subject not to be taken too seriously by those researching the mobility patterns of their own ethnic ancestors or current minority newcomers. 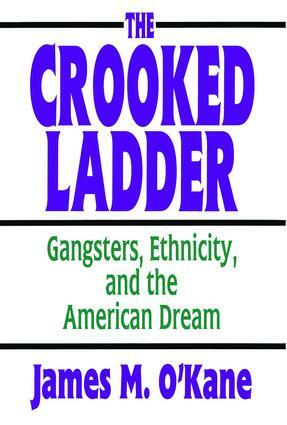 The Crooked Ladder represents a groundbreaking attempt to describe how some members of ethnic minorities have utilized organized crime as one vehicle of upward mobility, advancing from lower-class status to middle-class power and respectability.O'Kane illustrates the criminal road to prosperity as a process of displacement and succession: each group competes with and eventually eliminates its more established predecessor from the upper echelons of organized crime. This historical criminal succession mirrors the upward mobility of the Irish, Jews, and Italians in the larger, conventional noncriminal realm. Arguing that African Americans, Asians, and Hispanics are pursuing similar criminal routes, O'Kane takes issue with contemporary social scientists who view the current plight of minorities as unique in American social life.As a fundamental rethinking of the American ethnic experience with crime, The Crooked Ladder will be essential reading for social historians, sociologists, and criminologists. Now available in paperback, it will be useful in criminology courses and well as classes in ethnicity and social relations.